North Korea just ruthlessly shelled South Korea, killing two soldiers and two civilians. Iran continues to churn out enriched uranium for its nukes, all the while promising to wipe Israel off the map. China is rattling its formidable sabers, threatening Asian neighbors such as Japan and South Korea, and has warned the U.S. to stay out of international waters. Hugo Chavez continues to amass power, deploying his petrobucks to foment fascist revolution throughout South and Central America. Hezbollah has rearmed, primed to once again attack Israel. In response, the person holding the position formerly known as The Most Powerful Man on Earth… whines to the U.N. Security Council, shoot hoops with his posse and appears with the gals on The View (sample question: “Mr. President, may you live forever, when are you going to lock up those dangerous Tea Partiers who doubt your magnificence?”). Barack ‘Holiday’ Obama strolled into office two years ago promising to engage our enemies in mutual dialogue, treating as equals all leaders, whether democratically elected or apocalyptic lunatic. With sheer charisma and an open hand (and checkbook), Barack ‘I am a citizen of the world’ Obama would make the lion and the lamb lie down together. Unfortunately as any 3rd grader knows, you don’t slow down the school bully by voluntarily offering him your lunch money. 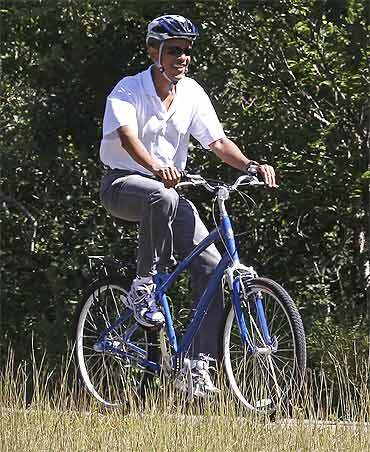 Obama’s feckless international adventures would be quite entertaining, except global strongmen such as Putin and Ahmadinejad are a tad more dangerous than Ricky Blutowski administrating wedgies to his classmates. “Hello Glorious Leader Hu? This is Barack Obama, of the United States. What’s that? Yes, I’m the one who bowed to your valet during our last visit. How are you Premier Hu? Good, good. Have you persecuted any Christians or Falun Gongers lately? I’m so glad it’s going well. “Say Premier Hu, if it’s not too much to ask, could you please consider suggesting that Kim Jung Il not attack South Korea again? You see, the Nobel Prize Committee has called and they want me to return my Peace Prize. What? Yes, they did call me the biggest embarrassment since the peanut farmer won. But if we can resolve this crisis without any more bloodshed, I’ll get to keep the Nobel and the $1.5 million as well. “Oh, you want the $1.5 million, in $20s, and another $60 billion? Well, let me call Secretary Geithner as soon as we’re done here ask him to turn on the presses. What’s that? You also want a 747 full of Hooters girls? Yes, I think that can be arranged, Premier Hu. Like many Americans, the Siesta Keyster took a reprieve from politics following the November 2 midterms. Our president, alas, did not. Fresh off his party’s historic rejection by the electorate, Barack ‘Holiday’ Obama gassed up Air Force One, packed his ‘prompters and before you should shout “road trip!” was doing what he does best: merrily bashing allies and his own nation on the world stage. In a dizzying tour that covered India, Indonesia, South Korea for the G-20 meeting, and finally Japan, our Dear Leader was desperate to recapture the magic. It’s hard to believe that just last year, heads-of-state were eager to pose for photos with the first superpower leader in history who actively sought to reduce his own country’s stature. Naturally, Barack and Michelle were the belles of the ball from Beijing to Burma. The big question: could the man known as “O-bow-ma” for his fawning supplication to dictators and genocidal totalitarians get his mojo back? Would the rest of the global media join their U.S. counterparts in desperately trying to repair BHO’s image after his embarrassing midterm pasting? 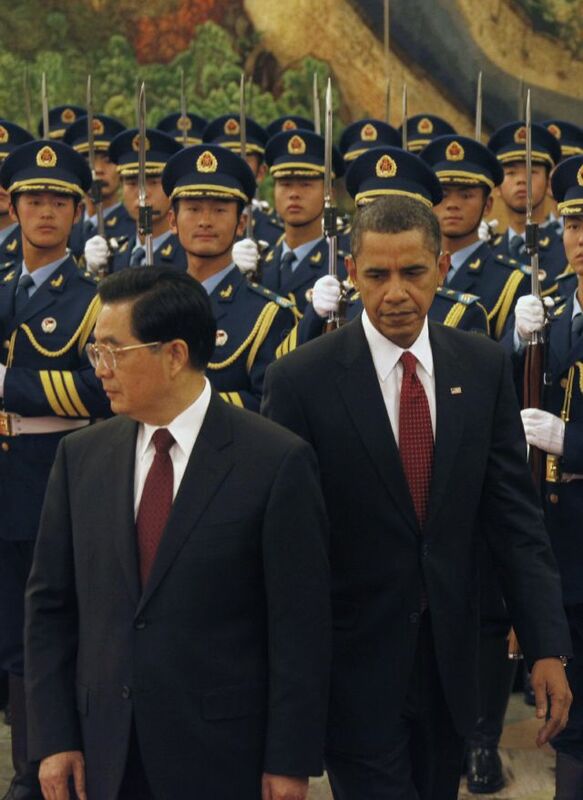 Would Obama use the G-2o summit to announce that the Chinese are now using U.S. Treasuries as wallpaper? India: Ate Indian food. Praised terrorist-sponsoring nation Pakistan. Michelle ravishing in a kicky sari. Barry demonstrated his dance chops with a wicked Diwali twirl. Indonesia: Ate Indonesian food. Got explosive diarrhea. Commended Islam as a religion of “peace.” Condemned Israel for not converting to Wahabbism and turning over all its land to Hamas for a terrorist training camp. Declared that he is a lot more Indonesian than American. 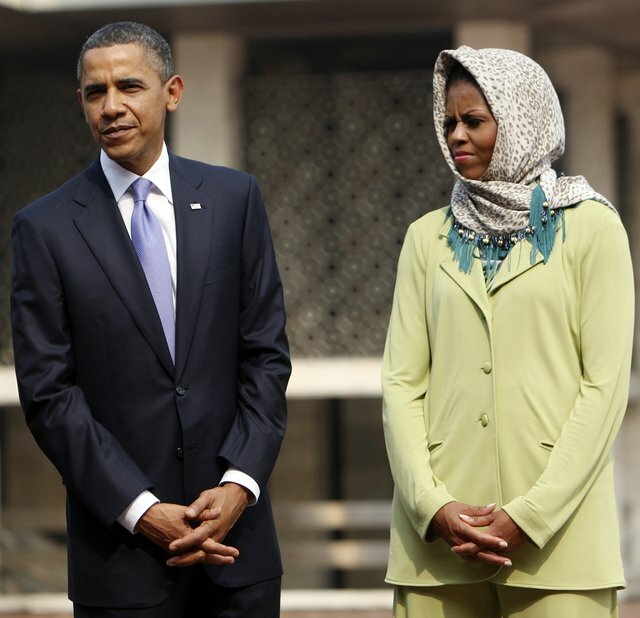 Michelle stunning in traditional hijab for evening prayers. South Korea: Ate Korean food. Called “breath of a thousand commodes” by French President Sarkozy after mistakenly brushing his teeth with kimchi. 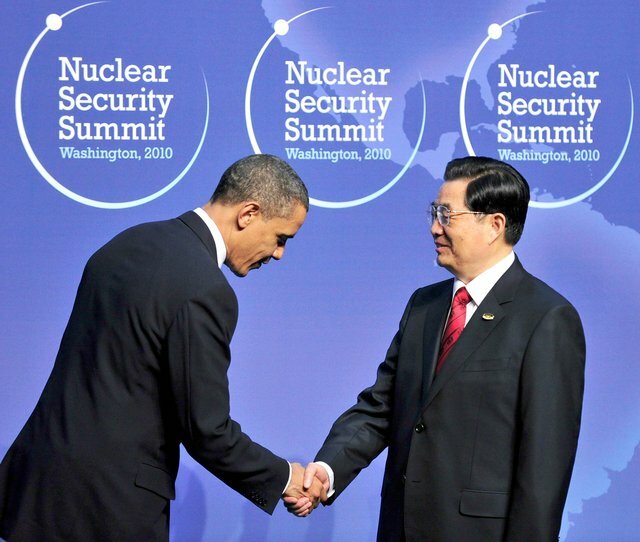 Performed CPR on Chinese dictator Hu Jintao after Hu hyperventilated laughing when Barack suggested that China strengthen its currency to help the U.S. Voted “Least Likely to Succeed” by the G-20 leaders. Declared that “all Asians look alike” after calling a Chinese reporter South Korean. Japan: Ate tempura and sushi. Bowed to the doorman, bellhop, valet and maid at his hotel. Told Japanese audience that he’s ordered a fleet of Toyota Prius hydrids because his new Chevy Volt “won’t even make it to the end of the White House driveway” on a single charge. 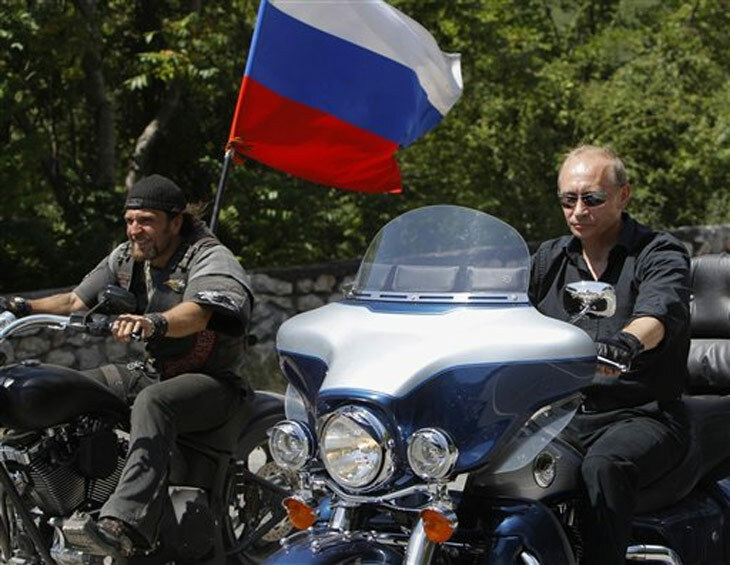 Apologized to Dmitry Medvedev after the Russian president stole his lunch money. Michelle wows the Japanese with her karaoke rendition of “What Kind of Fool Am I,” dedicating the performance to her husband. 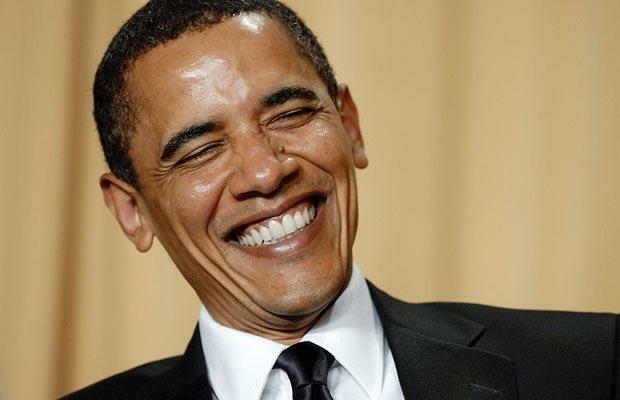 Tuesday’s midterm election were an unprecedented repudiation of President Barack ‘Holiday’ Obama and his Democrat pals. Republicans won at least 60 seats in the U.S. House of Representatives, installed at least six new U.S. Senators, and swept governorships and state houses in formerly blue states from New Mexico to Michigan to Pennsylvania. Mark Kirk even won the Senate seat that Barry himself occupied for nearly three months before he decided that his vast legislative accomplishments clearly cried out for bigger responsibilities. In response, a contrite and humbled President Obama faced the nation yesterday and apologized for his two years of reckless spending and relentless drive toward socialism that has brought the nation to the brink of fiscal collapse. Oh, wait: our Dear Leader actually said the election results show that he just needs to, you know, work a little closer with Republicans or something. A trying-to-act chastened Barry met with a roomful of reporter-supporters, most of whom were completed devastated that their guy, the man they’d worked so hard to elect in 2008, had been repudiated like a Hasidic rabbi at a Taliban council. 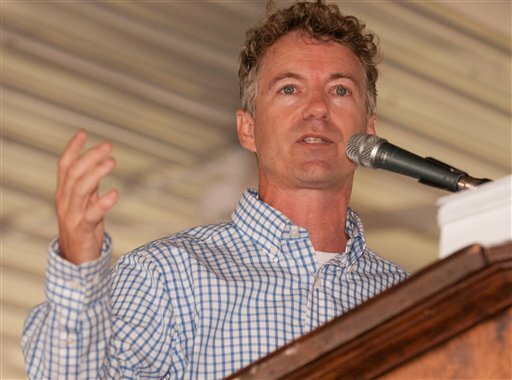 Sure, the “reporters” were compelled to ask a couple of tough questions (example: “Mr. President, does this affect the sweet potato harvest in Michell’s garden?”). But you could see on the faces of the New York Times, CBS, ABC and WashPo that this was tougher than telling the kids that the new puppy just got run over. Siesta Keyster observation: has there every been a confirmed sighting of Barack Obama admitting he made a mistake or was wrong? Sure, Obama loves to “take responsibility,” by which he means people are just too stupid to realize how great he is or it’s all Bush’s fault. So there was our Dear Leader saying, yep, he might consider a few “tweaks” to the nationalization of health care and the crippling of the banking system. But we sure won’t be going backwards, he said, as in actually trying to reverse any of his disastrous programs no matter what the voters think. The good news for our Dear Leader is that there is still one state where he’ll always fit right in. 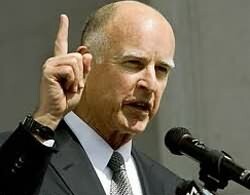 Yes, California stayed true to form, sending 92-year old Jerry “Moonbeam” Brown back to Sacramento to see how high he and the Dems can jerk tax rates. Golden Staters also re-inflicted the least-intelligent U.S. Senator on the rest of us, sending Barbara Boxer back to Washington for another six years. People are still scratching their heads over California’s failure to formalize its tacit legalization of pot. The Siesta Keyster has many loyal readers in California, true patriots to a person. Those of us in Floridia would like to remind you that Florida, which has NO income tax and low real estate taxes, is open for biz. Thanks to Obama and Barney Frank, we also have hundreds thousands of homes available at a fraction of what they cost before the Dems took over in 2006. We look forward to seeing you in our delightfully red and still free state.